Planning a project for your business is one of the most stressful things a leader can do. There are so many different elements to keep track of that it seems to never end. 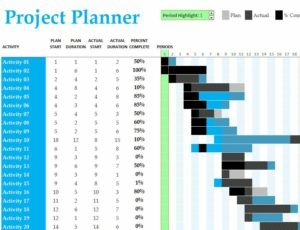 The Gantt Chart Project Planner can help you through your project, step-by-step. This spreadsheet is designed to help you first split up the project into separate activities, then plan out how they should be achieved in an easy to read manner. Even better, you can track the progress of your project through the beautifully designed color-coordinated system used throughout the document. Follow the list of instructions below to learn how to use the Project Planner today. Taking a look at the Project Planner, after downloading the file to your computer, you can see the general setup of the document. Your individual activities for the project will be listed to the far left and you will continue entering the information for each item listed above. For example, let’s say your project is to increase the sales of a particular product next month. Your first task could be meeting with your team to discuss this goal. You would then click “Activity 1” and write “Plan Introduction Meeting” to change it. From this point, you would enter the period in which the activity will be implemented/ completed. Since the example is an introduction meeting, it will be listed in the 1st period. Next, you will enter the duration of that activity. The next two columns are where you will list how long your activity actually took to complete. All your “actual” information will be listed in blue, if it goes beyond what you initially intended. Finally, you can keep track of the progress percentage, based on the number of days and how well your plan is coming along. You will enter this percentage in the “Percent Complete” column. If you need to highlight a certain period of your project, just use the navigational arrows in the top-left corner of the page. You can quickly see how the Project Planner template makes coordinating your goals so much simpler.